Ralph Engelstad Arena "Home of the Fighting Sioux"
The brand new $100+ million dollar facility known as "Ralph Engelstad Arena" opened its doors on October 5, 2001. Since that time, the facility has been host to many big attractions such as Tim McGraw, Stars on Ice, Dennis Miller, the Minnesota Wild, and many more. 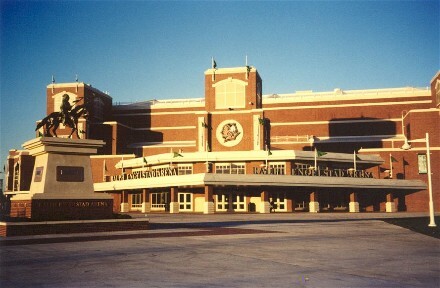 But the biggest attraction, and the reason the arena was built, is Fighting Sioux Hockey. In its inaugural season in the new Ralph Engelstad Arena, Fighting Sioux Hockey attendance erupted into an all time high. All of the games in this 11,500+ capacity hockey arena sold out in just 43 minutes after single game tickets went on sale. Before moving into the Ralph Engelstad arena the Fighting Sioux first played at a building built in 1936 for $46,000 and swept North Dakota Agricultural College (now North Dakota State University) 6-5 and 5-0. In these early days the building was also used by track and football teams, and during World War II the army trained troops in it. The final competition there, 394 games later, was a 10-2 win over the University of Michigan in league playoffs on March 8, 1972. It was used for storage between that time and its demolition in the summer of 1978 at a cost of almost $30,000. Capacity at the Sioux first home was an absolute maximum of 4.000, including students literally hanging from the rafters (3,868 was the official seating figure). Despite some bemoaning of the demise of the old "Barn" with its shortcomings that some viewed with a curious pride, fans who flocked to the new UNO hockey arena at its opening in the late fall of 1972 found an awe-inspiring sight, sparked by bright, modern and - very important - warm surroundings (as the old arena was not heated at all, and you plain simply don´t want not heated arenas in Minnesota). The anxiously-awaited $2 million dream had its first use November 10, 1972, when the Sioux beat Colorado College, 5-4. But it wasn't a smooth road that led to that evening. A delay in State Board of Higher Education approval was begat by problems with financial backing, some of which were caused by increasing construction costs vs. funding, as well as obtaining land clearance rights. Immediately after the last of those barriers was cleared, then UND President Thomas j. Clifford turned the first shovelful of earth July 22, 1971, and 475 days later the doors were opened. But the luxury and spaciousness didn't end with the building's original construction. The seating of about 5,700 was later expanded to 6,070 and in 1983 a three- story, 13,816-square-foot lobby on the east side was added as well. 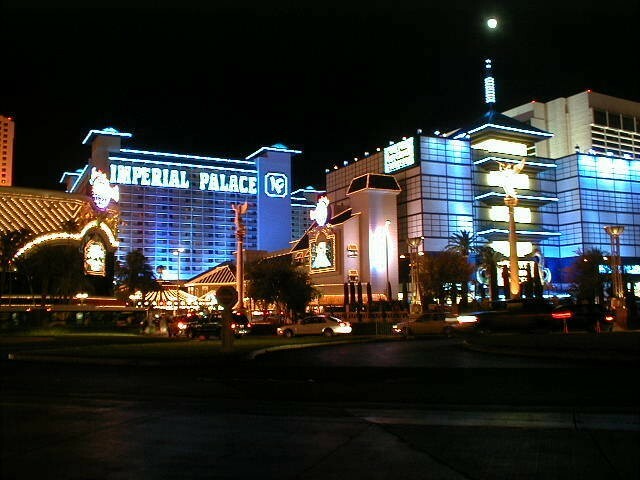 Today´s home of the Sioux was was christened on the 19th of February 1998 "Ralph Engelstad Arena" in honor of the 1954 UND graduate and former Sioux goalie from Thief River Falls, Minnesota, who went on to own and manage a number of successful enterprises, including his flagship, the Imperial Palace in Las Vegas. Many other former or still active famous players who played hockey at the University of North Dakota are know to hockey-fans around the world. Jason Blake, Murray Baron, Ed Belfour and Garry Valk are just a few of them who managed to play in the NHL. Neil Eisenhut, playing for the Duesseldorfer EG (can be found in the Germany-section of this homepage) in Germany during 2002/2003, also laced up his skates in Thief River Falls. Why all the hype? Magnificent. Elegant. Regal. Amazing. Marvelous. Incredible. It's impossible to describe the new Ralph Engelstad Arena in just a few words, but it is described by many as the "finest facility in the world." The 400,000 square foot arena is nothing but first class. All concourse floors are granite, each seat is constructed of leather and cherry wood, and there are 48 luxury suites. These are all components that make up a world class facility, but then add the training facility (which houses an underwater treadmill and a 10,000 square foot weight room), fourteen locker rooms, and don't forget the extra Olympic Sheet of ice that is attached to the arena, and many other amenities, and you have more than a world class facility, you have the Ralph Engelstad Arena. Architecture: Designed with the strong tradition of the University of North Dakota and its Fighting Sioux Hockey program in mind, your heart will definitely start pounding upon entrance to this new facility. UND's tradition will be highlighted from the "collegiate" exterior of classic masonry materials to the lobby entrance housing the National Championship trophies and highlighting of former greats, to the comfortable seats for close-to-the-action viewing. This facility will promote and continue to allow UND to be the premiere hockey program in the country. Getting tickets has been less of a problem since the inaugural season when there were basically no tickets left to buy once the selling had started. Parking is also convenient, at least if you arrive early, as there are 4.000 parking slots right at or at least near the building. 5.586 seats are located in the lower and 4.610 in the upper bowl with 9.30 seats in suits rounding out the arena (total capacity 11.406). For each level there are six concession stands which is not as much as one could expect as each one has to serve a theoretical number of 700-900 customers between periods. Of course not everyone in the building goes out for a beer, a coke or some food between periods but this could be better. Looking for a place to travel in 2005? The Ralph Engelstadt Arena will host the 2005 IIHF World Junior Hockey Tournament from December 25th 2004 until January 5th 2005. For ticket-packages contact urit@theralph.com.